Brabus, the longtime Mercedes-Benz tuner, has just announced that they have developed new performance packages for several models. The latest S500, CL500, S63 and CL63 AMG models were the focus and each are equipped with the German automaker&apos;s new V8 bi-turbo turbocharged engine. For the S500 and CL500, the tuner will offer two different engine packages. The first includes a new ECU for $7,160 USD that increases output from 435 hp to 482 hp. The second kit, costing $8,630, adds a supplementary intercooler that increases power to 520 hp. Both cars can reach a top speed of 188 mph when equipped with this package and in combination with the Brabus Vmax unit. For the S63 and CL63 AMG models, Brabus developed a package that features an ECU optimization of the 5.7-liter bi-turbo V8 and a water-to-air intercooler powered by an electric auxiliary pump, costing a total of $8,630. This conversion results in a power bump to 584 hp in standard form and 620 hp with 737 lb-ft of torque when equipped with optional AMG package. The most powerful versions will go from 0 to 62 mph in 4.3 seconds and have a top speed of 199 mph. 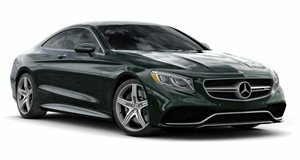 Additional components for the S63 and CL63 AMG models include a sport exhaust system, a limited-slip differential, and an aero kit with a front spoiler, rear diffuser, and carbon trims. 19 to 21-inch Brabus alloy wheels are also optional.